In manufacturing processes, where direct heating is not possible, a heat transfer medium is used. Steam used to be the only choice as water was easily available at low cost and resulted in very few environmental issues. Heat transfer by steam uses latent heat, i.e., the heat required to convert liquid into vapor without changing its temperature. The temperature at which the heat transfer takes place is determined by the vaporization or saturation pressure. For processes that require higher temperatures, the steam system pressures need to be higher too. For example, in order to obtain 662 degrees F / 350 degrees C, a pressure of 2,610 psi / 180 bar is required. These increasing pressure requirements mean that the heat exchanger tubes that are used in steam lines need to be thicker and specially constructed and high-pressure pumps need to be utilized, which ultimately result in higher construction and operating costs. On the other hand, thermal fluid used as a heat transfer medium is much more efficient compared to steam. For example, at temperatures as high as 662 degrees F / 350 degrees C, the pressure requirements for heat transfer systems are commonly rated for up to only 150 psi / 10.3 bar with design pressures seldom exceeding 300 psi / 20.6 bar. 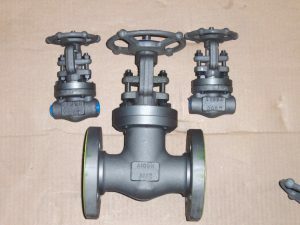 The pumps that are used in this process are less expensive than the ones used in high-pressure steam and the process lines can be constructed from thinner materials because they do not have to withstand high pressures as in steam piping. With thermal fluid heaters, the efficiency is known to be higher than with conventional steam systems. Flash losses in a typical steam system can be 6% to 14%. Add to that blowdown losses up to 3% and de-aerator losses of 2%. Clearly, the difference in the efficiency of the two systems is pronounced as thermal fluid systems do not suffer any of these losses and can operate up to 30% more efficient. One of the common problems in steam systems is corrosion. Hot water, air and salt combine into solids and cause metal corrosion. Scale and other mineral deposits build up adding to the corrosion. Thermal fluids are non-corrosive and provide a high degree of metal surface protection. Vessel and piping designs for hot oil heating systems often factor in a small corrosion allowance though it is not required. For pressure-fired steam systems, law (in many areas of the country) requires that they be operated by full-time, licensed boiler operating engineers. On the other hand, thermal fluid systems operate at lower pressures and are vented to atmosphere at the end of the expansion tank. 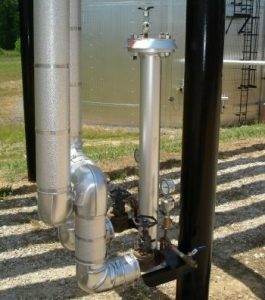 The pressure in these hot oil heating systems is limited and seldom require licensed operators. Steam systems require a lot of maintenance. The traps, valves, condensate return pumps and expansion joints require constant attention. Thermal systems are safe and operate efficiently for years with minimum maintenance. As with all petroleum based products, thermal fluid does have a useful life span and can become fouled and degraded over time with very fine particles of carbon. Incorporation of a fine micron filter to remove these carbon particles can help to extend the useful life of the thermal fluid. It is recommended to implement regular fluid analysis testing to monitor the fluid condition. In steam systems, the water is chemically treated to reduce corrosion. This chemically treated water cannot be discharged into sewers because of the hazardous chemicals and hot temperatures of the process water. Thermal fluid is easier to dispose of and can be combined with other used lubricants, sent to the local industrial oil recycler and reprocessed into useful products. Steam systems rely on the control of pressure and temperature but as the system ages and corrosion takes a toll, it becomes more challenging to be able to control and maintain accurate and constant temperature that all manufacturing processes demand. Thermal fluid systems are known to provide efficient and uniform heating and they also have the ability to provide uniform cooling. Overall purchase costs of steam systems are less than the purchase costs of thermal fluid systems. But the benefits of accurate temperature control, improved safety, reduced workforce costs and the overall economy of the thermal fluid systems makes them a practical and popular choice for many industries.